On 23rd July 1745 Prince Charles Edward Stuart, son of James ‘The Old Pretender’ landed on the Isle of Eriskay off the west coast of Scotland. This was the start of the ‘Forty-Five’ Jacobite Rebellion. 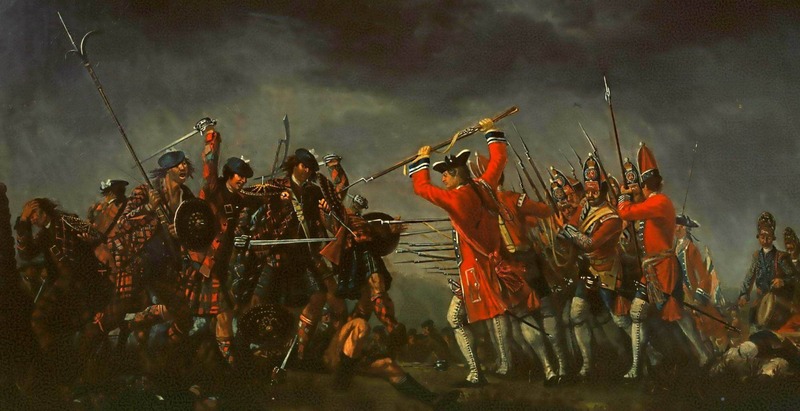 The following events culminated in the last major battle to be fought on British soil… Culloden. 1688 Nov ‘The Glorious Revolution’. Following the invasion from Holland by William of Orange, James II, the Catholic King of England, Wales, Scotland and Ireland, flees to France. 1689 27 July Battle of Killliekrankie. Supporters of James II, the Jacobites, led by Viscount Dundee defeat a Protestant Covenanter army. 21 Aug Jacobites attempt a rising at Dunkeld, Scotland. 1690 1 July William of Orange defeats James II and his Jacobite supporters at the Battle of the Boyne in Ireland. 1691 12 July Irish Jacobites defeated at the Battle of Aughrim. Aug William of Orange (pictured below) offers a pardon to all Jacobites in the Scottish Highlands who swear allegiance by year-end. 1692 Jan King William III issues an order to discipline the Highland Scots. 13 Feb The Glencoe Massacre. After the MacDonald chief was late talking his oath to King William, members of the Campbell clan killed 38 members of the MacDonald clan at Glencoe. 1696 Feb A Jacobite plot to murder King William III was uncovered. 1701 12 June Act of Settlement passed by Parliament, ensured that if William III and Princess Anne (later Queen Anne) should die without heirs, the succession to the throne should pass to Sophia of Hanover, granddaughter of James I, and to her heirs, if they were Protestants. The house of Hanover, which ruled Great Britain from 1714, owes its claim to this act. 6 Sept Death of the deposed James II. Louis XIV of France recognises his son as James III, later known as the ‘Old Pretender’. 1708 23 March A French naval squadron attempted unsuccessfully to land the Old Pretender on the Firth of Forth near Edinburgh. 1715 6 Sept Start of ‘the Fifteen’. Following the accession of King George I, a Jacobite rebellion started in Braemar in Scotland. 13 Nov The Scottish Jacobites were defeated at the Battle of Sheriffmuir. 14 Nov A Scottish and English Jacobite force was defeated near Preston in northwest England. 22 Dec The Old Pretender lands at Peterhead in northeast Scotland, joining Jacobites at Perth before returning to France on 4 Feb 1716. 1722 24 Sept The Atterbury Plot. The Bishop of Rochester, Francis Atterbury, a Jacobite leader was arrested and later exiled. 1745 23 July Start of the ‘Forty-Five’. Prince Charles Edward, son of James and also known as the ‘Young Pretender’ (pictured below), landed on Eriskay Island off the west coast of Scotland. 19 Aug With support from some of the Catholic MacDonalds, Charles ‘Bonnie Prince Charlie’ was able to gather his men at Glenfinnan. There the standard was raised and his father was proclaimed King James III and VIII. 11 Sept Jacobites capture Edinburgh. 21 Sept Jacobites defeat a British force at the Batlle of Prestonpans and move south into England. 4 Dec Jacobites reach Derby, just 150 miles from London. Due to lack of support Lord George Murray and the other chiefs advise Charles to return to Scotland and wait for French help. 18 Dec Arguably the last ‘battle’ to take place on English soil, the Clifton Moor Skirmish saw the retreating Jacobites meet the Duke of Cumberland’s forces at Clifton in Penrith. Twelve Jacobites and fourteen of the Duke’s men were killed, with the English being buried in the Clifton churchyard and the Scots under an oak tree (known locally as the Rebel Tree), where a plaque still remains. 1746 17 Jan Back in Scotland the Jacobites fail to capture Stirling Castle, but then defeat General Henry Hawley’s army at the Battle of Falkirk Muir. 18 Feb Withdrawing ever further north, the Jacobites capture Inverness. They stay there for 2 months. Meanwhile a government army, led by the king’s younger son, Prince William Duke of Cumberland, was catching them up. 16 April Against the advice of his chiefs, Charles lined up the Jacobite army – hungry and tired – on the flat moor of Culloden. It was to be the last major battle fought on British soil. In less than an hour Cumberland’s cannon destroyed the military threat of Jacobitism. 20 Sept Charles fled Culloden Moor with a reward of £30,000 on his head and after many adventures, he eventually escaped on a ship to France. 1766 1st Jan Death of the Old Pretender. 1788 31 Jan Death of the Young Pretender. 1807 13 July Death of Henry Stuart, Cardinal York, younger brother of the Young Pretender and the last Stuart in the male line.